TV Size 16" to 40"
Good price and solid construction. Attached level to the wall but does 'tilt' by the time you finish with the TV attached to the extending arm. I just wanted to clarify if this bracket lets you turn the tv at 90 degrees (or close) to the wall? Hi, yes. The bracket won't allow the TV to be totally flush with the wall, but it will fold right back. The Thinner LED tv's would also assist with aesthetics but it's not bad at all really. Yes. It allow you to push the TV flat to the wall or to pull it out at 90 degrees. It will depend how big your TV is though. Mine is 32 inch and I can easily turn it 90 degrees. Is the quality of this Mounts good? 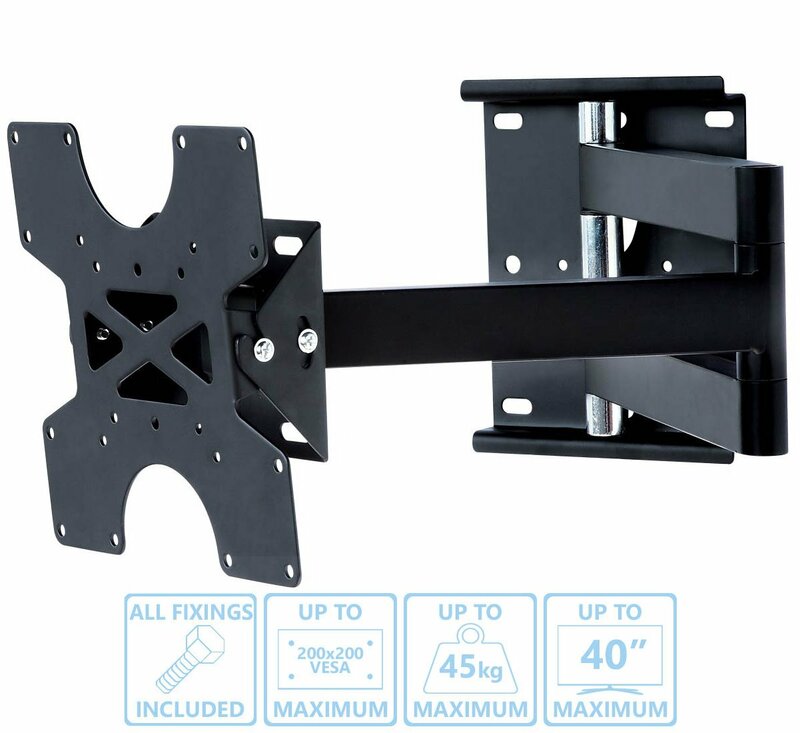 I have a new ultimate 40' Samsung TV which weights around 8 kg... Is this bracket good enough ot it is low quality adn there is a risk of that the tv will fell down? When you are moving the bracket it is very loose or not? Thansk a lot for your answer. Its a very strong and sturdy bracket, Im hanging a 36in from it. The movements are also very secure and reassuring, cant fault it in anyway. I've got a 27" tv & need to fix it to a plasterboard wall, any suggestions as to the best way to do this.. There's nowhere else it can go!,.. The weight of the TV is important: I had a 42" plasma that weighed 30kg, which I thought would put too much strain on the bracket, so I bought a Samsung LED which weighs 11kg. Plasterboard had doesn't have enough strength to take the leverage applied by the bracket (outwards at the top, inwards at the bottom), especially when it is fully extended, so the bracket should be fixed through the board into the wall behind (if it is brick/stone), or into the studs (if it's a stud partition). 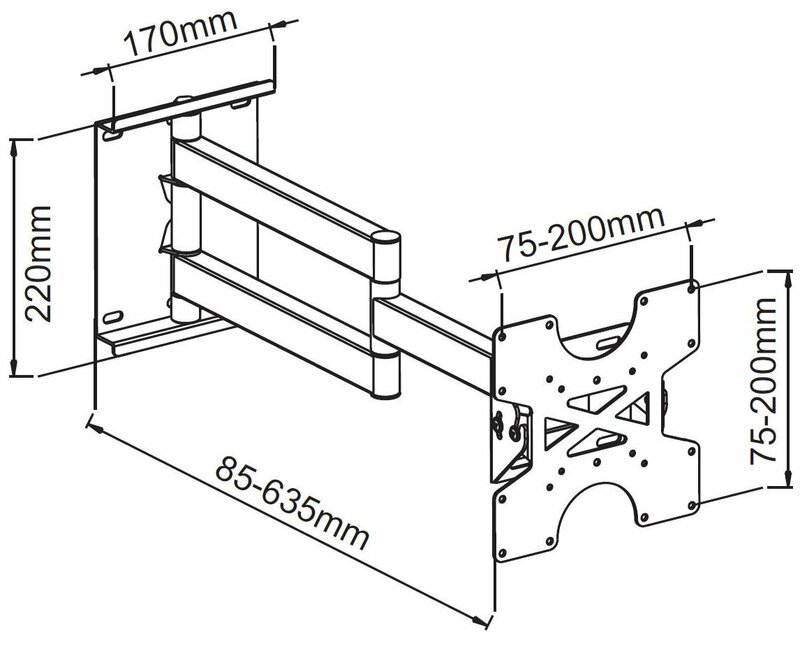 The best solution is probably to make a stiff plate out of 1 inch (approx) thick wood or MDF, larger than the base of the bracket but smaller than the TV (so it's hidden from sight), fix that through the plasterboard to the wall/studs, and bolt the base of the bracket to it (you can push the bolts in from behind - much stronger than screwing the bracket from in front). 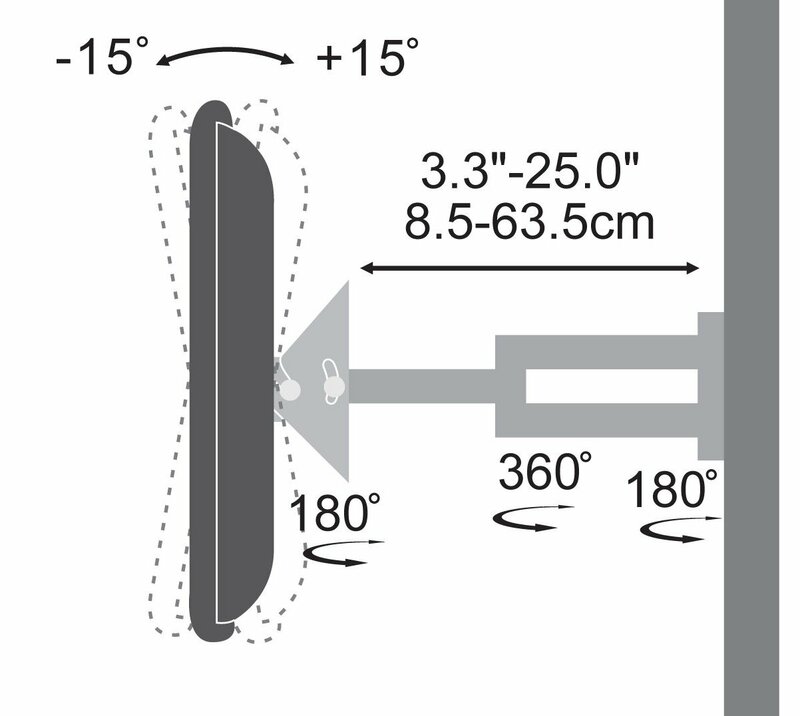 That would spread the load on the wall (the tension on the screws fixing the upper edge of the plate to the wall diminishes with distance above the centre of the bracket, and the pressure on the plasterboard diminishes with distance below the centre - pure physics). Hope you can understand this, and that it helps. The base support for the bracket is rectangular and I cut out the same shape as the base in the plasterboard and fitted in wooden batons to the brick behind the plasterboard. I then replaced the plasterboard cut out back in and then filled around the edges. The base plate then covers the "patch" and you can secure the base to the batons which you have in turn secured to the brick, thus strong and safe. I am fitting a 37 inch screen which weighs 13 kilos to a dry line wall with it,is that safe? We fitted a 22" combi TV DVD to a concrete wall, the UM2703L with the long arm suited us as the tv serves the purpose of two adjoining rooms. If you have concrete or solid structure behind the dry line you should not have a problem as there is a good size wall plate and anchors to be drilled to a depth of 55-60mm. 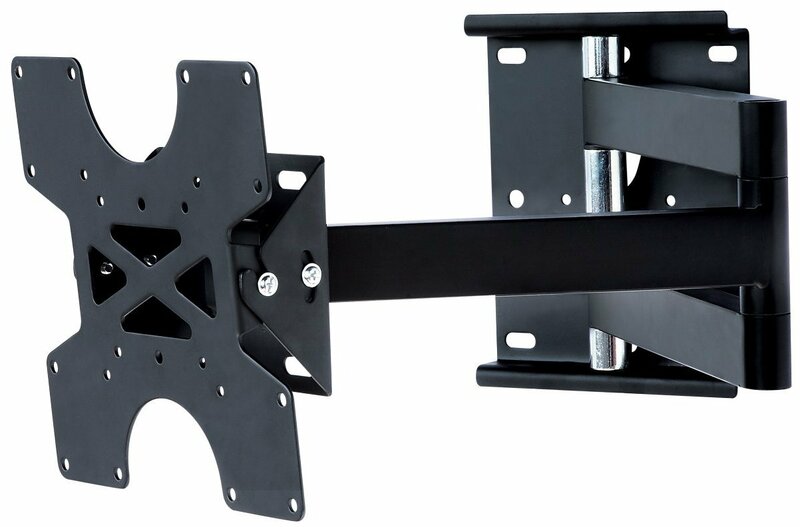 I have purchased a 28" led screen Hannspree tv will this bracket fit it? If so, are all the screws supplied to attach the tv to this bracket as I have no accessories kept with my tv. I looked it up on the Internet and it said it will fit. Hope this is useful. 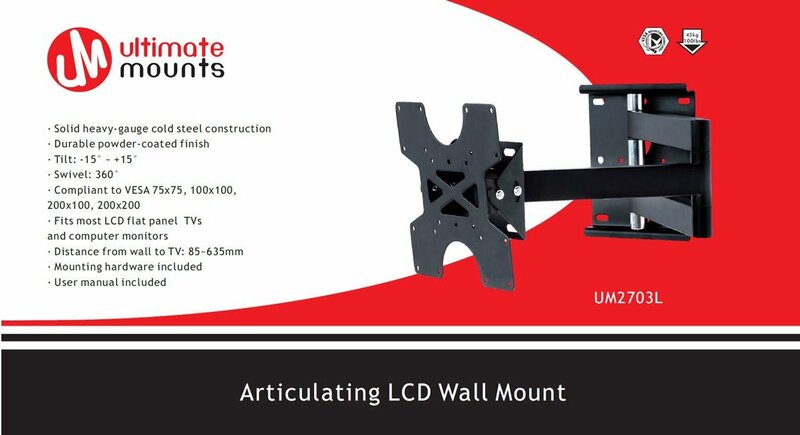 The dimensions of the mounting plate on the back of your tv are what matters. My new panasonic was 200mm by 175 and that was fine. It's a good strong mount but you need to be confident about drilling decent holes in your wall. I put extra screws in as well.